In an interview with APA, Lunacek, who has led the Austrian Green Party list in the European elections and has previously worked as foreign affairs spokesperson of the Green group, argues that Georgieva is “best suited” to succeed Ashton. Lunacek says that Georgieva has played “an extraordinary role” in her capacity of commissioner responsible for international cooperation, humanitarian aid and crisis response. “On humanitarian aid, which is her current portfolio, she played an extraordinary role and she is also at home in this world,” Lunacek stresses, comparing her to Ashton whose major handicap according to her has been that she has “not really been at home in the world of foreign policy”. The Austrian Parliament Vice President, who in the previous parliament served as rapporteur on Kosovo recognises, however, Ashton’s contribution for advancing the dialogue between Pristina and Belgrade. The main criterion for selecting Catherine Ashton’s successor, said Lunacek, is that the person must bring experience, competence and connections. “The High Representative cannot change disunity among member states. But what he or she can do, is have more confidence to tell the member states what to do,” she said. Georgieva was appointed as Commissioner under the previous centre-right government of Boyko Borissov, and has consequently been seen as EPP-affiliated. However, she has no political record in Bulgarian politics. EU leaders will discuss the successor of Ashton, as well as of Council President Herman Van Rompuy and the next Eurogroup President at an extraordinary EU summit on 16 July. 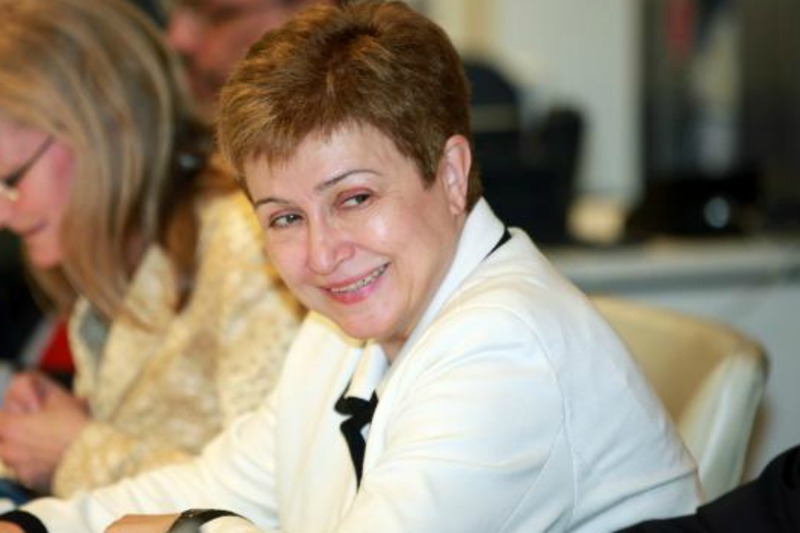 The name of Georgieva has already be mentioned as a strong hypothesis for the foreign affairs portfolio. Another name mentioned is that of Italian Foreign Minister Federica Mogherini. Bulgarian Prime Minister Plamen Oresharski said yesterday (3 July) that he plans to represent his country at the 16 July summit, despite the fact that he is due to resign a week later. Bulgaria is led by a minority government with a record-low level of support from the population (see background). The pressure for the cabinet to resigned has increased over a recent bank run. Oresharski also said that he would not propose a commissioner during the summit, but rather “get orientations” and exchange views with the future Commission President Jean-Claude Juncker. He explained that during recent consultations hosted by the President Rossen Plevneliev, it has been decided to decide on “criteria” and on “holding consultations with the various political forces on the candidacies for the future commissioner”. Diplomats say, however, that those leaders who would not present candidates on 16 July won’t be able to play the game of the top jobs. The press also speculates that Sergei Stanishev, leader of the Bulgarian Socialist Party (BSP), the senior coalition partner in the outgoing cabinet, might also be interested in becoming Commissioner. Stanishev, who is also President of the Party of European Socialists (PES), has just been elected as MEP. Juncker is expected to be confirmed by the Parliament as Commission President on 15 July. After that, he is expected to send letters to EU governments and invite them to propose candidates for commissioners. 16 July: Leaders meet for extraordinary summit to decide on top jobs. Dnevnik, the EURACTIV partner in Bulgaria: ????????? : ???-???????? ??? ?? ??????? ? 23 ?? ?, ????? Dnevnik, the EURACTIV partner in Bulgaria: ???.-??????????? ?? ?????????????? ???????? ?????????? ????????? ?? ????????? ?? ????? The person to replace Ashton should be able and determined to change this ‘High Commissioner’ position into a fully functional Foreign Affairs office. The minister for foreign affairs should not only be able to open the borders for humanitarian help but also be able to close them to those who have no right, and that would include a lot of today’s illegal immigrants. I have the feeling this position is being treated like some sort of fantasy thing. I do not know Kristalina Georgieva and I have no doubt about her qualities. But a CALL from the Green party, THE party which helped anti-European people (UKIP) to settle down in EU Parliament, which helped people who want to destroy the European Union from the inside, such a CALL IS DUBIOUS. I wonder which game the Green party is playing. Georgieva sounds like a serious and intelligent person who’s shown she can work dilligently, has a solid understanding of international affairs and a distinguished record of work. Moreover, she would help to balance the demographic profile of the Commission not only because she is a woman but also because she’s from a “new” EU member-state. Except, we’re going to have the Italians demanding that their current foreign minister takes over this role because the Socialists need some big posts and Renzi thinks he is the God of the Europe and that Italy is a major player in the EU. Despite the fact that the Italian foreign minister has only been in that position for four months, doesn’t seem to have any prior experience in anything useful and, like the Renzi government as a whole, has absolutely nothing to show for the work she’s supposedly done so far. Another plus in Georgieva’s favour is that she’s worked for the World Bank so has an understanding of how international organisations work. The European External Action Service still needs to be built up properly, and Ashton did very little in that direction, probably because she’s a Brit and thus has no idea how the EU works and is intrinisically opposed to the concept of Europe-wide institutions. Kristalina (born as Stalin-ka) Georgieva is an experienced, responsible and studious official who might perform much better than Baroness Caterine Ashton as Commission Vice President and High Representative of the Union for Foreign Affairs and Security Policy. However, she lived permanently outside Bulgaria in the last 30 years and could hardly be perceived by most Bulgarians as a true Bulgarian Commissioner. Thus she is widely considered as a US functionary, rather than a Bulgarian one.